The summer is over and the fun, free, limitless driving you have been enjoying over the last four months has finally come to an end. It’s time to put away the summer car and break out the strong and steady winter machine. 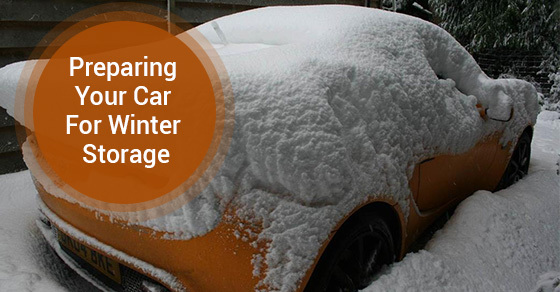 If you are putting your summer car in storage during the colder months, below are some tips to help you prep it and ensure safe storage. You will want to make sure you choose a storage location that is not only secure and reputable, but one that has the appropriate climate control mechanisms in place to ensure that your car is stored in an optimal environment. Too cold or too hot and come the following spring, your car may be in need of some expensive and avoidable repairs and tune ups. Before placing your vehicle in storage, you will want to make sure that it is protected by an appropriate insurance policy. Vehicles in storage still require comprehensive coverage, but you will be able to save some money on coverage that is only necessary while you are driving on the road with other vehicles. Making sure that there is nothing on your car’s exterior—including insects, debris and bird droppings—will protect the paint during storage. All of the aforementioned contaminants are corrosive and will damage your car’s paint job, especially when left on for months at a time. Either take it to a wash or give it a thorough scrub before placing it in storage for the winter. Gas breaks down over time and will end up causing damage to your carburetor and fuel injection components. The best way to mitigate this possibility is to add a quality fuel stabilizer, such as STA-BIL, to prevent deterioration and keep the fuel good for up to an entire year. Drive the car around the block once you’ve added the stabilizer to make sure it mixes properly with the gasoline. Unused batteries lose their charge over extended periods of time. Take the battery out and keep it in a safe, dry location. To ensure that your battery is still functional when it comes time to take your car out of storage, invest in a trickle charger. You had fun with your summer car; make sure that it’s in full working condition for many more summers of fun by taking the time to do some quick prep work before putting it away for the winter. Incorporate the above tips into the storage procedure and ensure that when you remove your vehicle from storage it is in full working order.